Since 2012 we have raised a fantastic £250,000 for local causes! The Newmarket Open Weekend strives to support charities close to the town and at the heart of the racing industry. 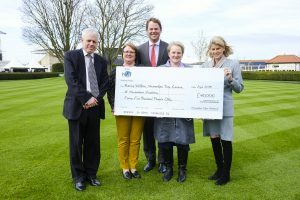 Charities to benefit from funds raised at the Open Weekend include MAGPAS, Racing Welfare, the Newmarket Day Centre, the National Heritage Centre for Horseracing & Sporting Art, the Racing Centre, IJF, and the Newmarket Academy. The Racing Welfare Newmarket Housing Project for young racing staff to help them in their transition from dependence to independence and to give them the best possible start to their careers in the racing industry. Racing Welfare are about to embark on a plan to refurbish our 18 bedsits in MacDonald Buchanan House and once completed these will form the core of their young people’s accommodation in Newmarket. Officially opened to the public in 2016 by the Queen, the Heritage Centre boats a number of great attractions, including the National Horseracing Museum and National Gallery of British Sporting Art. Visitors at the Heritage Centre also get the wonderful chance to meet retired racehorses in the flesh, which are stabled in the Heritage Centre’s Kings Yard. The National Heritage Centre, shortlisted one of five museums as finalists for Art Fund Museum of the Year 2017, will be open both days of the 32Red Newmarket Open Weekend. The Newmarket Day Centre is a successful independent community resource working with retired and frail older people to enable them to have and enjoy a better ‘Quality of Life’. NOW funds raised and donated from 2016 and 2017 have helped to finance the building of a walk-in shower for the elderly at the Centre, and also funded the refurbishment of the front of the existing conservatory, including an extension and new windows. This will be our third year supporting the Newmarket Day Centre. 10% of all money raised will be donated to the newly elected Newmarket Mayor’s chosen charity for 2018. The NOW grant is newly established this year and will allow people from the racing community to apply for help with funding their individual projects. The NOW grant committee will review each application. Pictured is our 2017 chairites receiving their cheque. Thanks to all for their kind support!